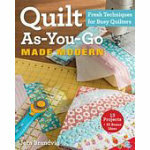 A modern approach to quilting that's fresh, fun and simpler than it sounds instead of dealing with precise paper patterns and cutting measurements, fabric gets pieced directly onto small manageable batting blocks. After the blocks have been joined, simply add backing fabric and binding. Go your own way: This method can be used with a pattern or intuitively improvised, creating a wide variety of design options. 13 projects plus 25 bonus ideas.